I’ve got to start working on this earlier in the day! Obviously, with the results of the presidential election tonight, at least 50% of Haitian voters are disappointed, and we are taking safety and security quite seriously. Tonight, rather than the scheduled outreach, we stayed in and spent time with the boys here in the care of the Center of Hope. We had a time of “verbal worship” as we listened to one another answer two questions: how has God revealed Himself to you? and how has that changed your life? The Haitian, American and Dominican stories were so beautiful and moving. Jesus was lifted up and many tears rolled down. Common themes touched on hope, grace, purpose and forgiveness. What an amazing group of people. What an awesome God. We’ve only been together for a bit more than 48 hours, yet this is a family! Most of the day was spent working on the basketball court. Mixing water, sand, gravel and cement. Pumping more water from the well (no, not for drinking.) a bucket brigade passing the concrete mix down to the forms, pouring it out, passing it back empty. Lather, rinse, repeat. Making the backboard from scratch since the airline reps at LAX refused to allow us to bring the one we purchased (after clearing it with them by phone.) Measure, cut, paint, mark. Prune the tree overhanging the court. Dig the hole for the pole. We had some great breakthroughs today too. We don’t mind hiring locals for pay – providing jobs is beneficial for the community. But we’ve also been trying to engage people in helping each other. Today we had a good group from the community join us to help build THEIR court, which is great and encouraging progress seeing increased ownership. Also, we connected with several new people and organizations who we have been hopeful to develop future relationships. Much to pray for, much to praise for. 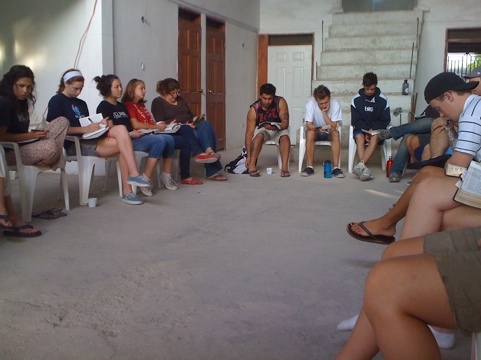 Now we are beginning a new day, starting with team devotions in the Word, then onto breakfast and pouring more concrete to finish the court.